you're carrying, and you know how heavy that feels. 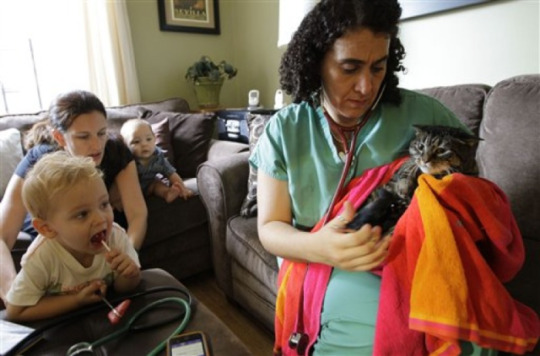 In what may be a trend, during the last few years, in most towns and cities one is able to find a vet who will make a house call when a pet is dying. That is a true godsend to those in the midst of grief - really it is. Some vets have even devoted most or all of their practices to home visitation for their sick dog and cat patients. And that is especially welcome to many pets and pet owners. Most vets who make house calls charge extra for these visits, maybe twice as much as an in-office visit, according to a recent story by The Associated Press. but many pet owners are happy to pay it because of their pets' or their own special circumstances. In New York City, for example, where many pet owners don't even own a car, many cab drivers won't take pets in their cabs. 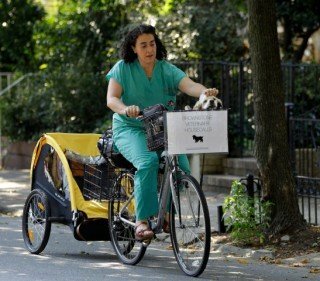 Elderly persons find it especially hard to attend to their pets' medical needs because of lack of transportation. For the dog or cat needing treatment, the occasion of a house call is much more natural than going to the vet's office - just another visitor in the home. The pet is not bombarded with a million different smells of other animals and of strong strange medicines and disinfectants that cause those horrible fears to come on when you're a mile away from a vet's office. House call vets report that the reduction in fear in their patients makes it much easier to do their jobs. It also gives the vets a better understanding of their patients' environments, some of which may contribute to their illnesses. It's easy to see why a houseful of cats might be obese when you see there are full food bowls all over the house, for example. Behavioral problems are often equally shared by pet owners and pets. Maybe your vet or another vet in your community offers home pet visits. It's probably a good idea to find out who you might call should you feel your pet would benefit from a home visit, or maybe you might benefit from a vet's home visit!